I'll add that the day is about those who have made the ultimate sacrifice rather than about those of us who survived. Memorial Day is about remembering the costs of the freedoms that we enjoy. And it's about enjoying those freedoms. Enjoying our lives is the greatest tribute that we could make to those who gave theirs to America and the world. The following letter was sent to me by someone who was the cousin of Sergeant William Erikson. This letter will probably come as a surprise, but the notation of the date will explain. Maybe it is not the thing to do, perhaps open old wounds. Yet I feel sure that you recognize, as I do, that our loved ones live on in the impression they have made upon others. March 1, 1945, I was awakened at 5:30 A.M. by Sgt. Erickson. We were sleeping side by side between the tracks under the tank we loved. He was William to you, but to us, he was Sergeant Eickson, the man we will ever be proud to say we knew. The sun came up shortly and the ground was covered with snow, much as today. We ate breakfast together, for I stuck close to the Sgt. I knew that big things had been cut out for us that day, and I was scared. He explained to me that after a man saw what had to be done he somehow received the courage to do it. I didn't understand exactly what he meant until several weeks later. We moved out at 8:30 and soon passed all of the light artillery and finally got up to where there was only infantry. These moved rapidly from place to place, or stayed low on the ground, or behind walls. As we cautiously advanced, elements of the division and battalion kept pulling to the side until we, alone were in the lead. We were the lead of the lead platoon of the lead company of the lead battalion of our division and our chances were very slight. As Sgt. Erickson put it, "Well, somebody has to be out here, and I guess it's us." We stopped within the protective walls of Berg, Germany and got out of the tank and took a smoke. Lt. Wheeler told the Sgt. to take the platoon lead and gave him the information which he sadly relayed to us, "The 78th Infantry Division has opened a drive to Cologne, and has been stopped at the hill for two days." It was heavily protected by anti-tank guns, tank destroyers and the Infantry. Over it lay Wollersheim, key city to the defense of Cologne and the Remagen Bridge (but we did not know it at the time). By this time, I was really scared and the Sgt. said, "Zeirs, just keep your eyes and ears open and do as I have shown you and you'll come out on top." Those were his last (personal) words to me, and they are as true today as then, two years ago. We climbed into our tank and started off when all Hell broke loose. Just before it happened, Sgt. Erickson's voice came over the wire, "Prugh, you had better close your hatch, I smell trouble." His last words were typical, his thoughtfulness of others. There are many who will never forget him. William M. Erickson, Jr., age 34, Staff Sergeant with Company C of the 19th Tank Battalion of Combat Command A of the 9th Armored Division. Having survived the Battle of the Budge, he lost his life in March 1945 when his tank was hit by artillery fire in an attack on Wollersheim, Germany, on the 9th's "drive to the Rhine." You may have been here before and seen these posts which are under my Bonds category and include posts about Chance Phelps, Aaron Weaver, Mathew Schram, Jason Dunham, Geoffrey Morris, Jakub Kowalik, and Pat Tillman. Doggerel Pundit has a poem inspired by Chance Phelps. Winds of Change has a Memorial Day Love Story. The Laughing Wolf has an articulate post about Memorial Day. The Stryker Brigade News has a new photo site set up for the whole Brigade. There are tons of cool pictures. Check it out. Our military is one of the last bastions of slavery in the United States. At the moment, our slaves are stuck in a combat zone, getting killed and maimed, and there's nothing they can do about it except hunker down and pray. You can read the whole "piece". Suffice it to say that Reggie should have stuck to football. You can contact Reggie here and Gary Moore, the Editor of the Denver Post, here. It's especially offensive as you decided to publish it over the Memorial Day weekend when we are honoring the sacrifices of our men and women. Yes, they died to allow Mr. Rivers to say whatever he wants to say. Yes, they died to allow you to publish whatever you want to publish. And yes, they died to keep us free - and that means that I can choose which newspaper to read. I won't be reading your tactless paper ever again. Update: Pool of Thought has more (and also sent me the link to the op-ed piece, too). And if you just keep scrolling, he's been having an email debate with Reggie Rivers. Update: Sgt. Hook and Baldilocks have awesome posts about this letter. Tomorrow is the Seventh Anniversary of my marriage to Mrs. Blackfive. It's also Memorial Day so we are celebrating our Anniversary today because tomorrow is for remembering the ultimate sacrifices made by our men and women to keep us free. To say that the last seven years have been a whirlwind would be an understatement. You might have read about the Iraqi merchants that had their arms amputated by Saddam Hussein for accepting US currency from customers. They were brought to the US to have prosthetic devices fitted. Now, they are honoring our fallen heroes and meeting the President of the United States. ARLINGTON, Va., May 27, 2004 — As the sound of "Taps" wailed from Army Sgt. Major Henry Sgrecci's bugle today, seven Iraqi citizens pressed their new prosthetic hands against their hearts at the Tomb of the Unknowns here to honor U.S. service members who have given their lives in Iraq. 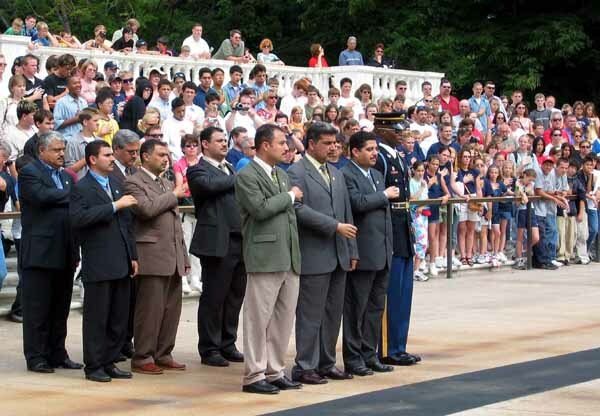 Seven Iraqi merchants put their new prosthetic hands across their hearts May 27 while laying a wreath at the Tomb of the Unknowns at Arlington National Cemetery in honor of U.S. service members killed in Iraq. The seven men, all Iraqi merchants, have been in the United States since mid- April to receive their new "bionic" hands to replace the ones amputated by former Iraqi dictator Saddam Hussein as punishment for trading in U.S. currency. In addition to providing them with new $50,000 prosthetic hands, U.S. doctors in Houston also removed the tattoos Saddam had imprinted on the merchants' foreheads to draw further attention to their misdeeds. During this week's visit to Washington, D.C., the Iraqis made a pilgrimage today to Arlington National Cemetery, the final resting place for 65 service members killed in Iraq. There, the group laid a wreath at the Tomb of the Unknowns to honor U.S. service members killed while overthrowing the brutal regime under which they and millions of other Iraqis had suffered for decades. Nasaar Jondi, one of the merchants, reflected on his predicament nine years ago, as he sat in prison waiting for Saddam's doctors to chop off his right hand. The night before his sentence was carried out, Jondi wrote his wife, "Do not be sad. Hopefully Allah will replace my hand with an even better one." Today, as the proud recipient of a new prosthetic hand made possible through donations by U.S. medical facilities, medical staff, companies and citizens, Jondi reflected on his new fortune — personally and as an Iraqi citizen -- and the cost that made it possible. "Without the tremendous sacrifices of American servicemen and women, we would never have had a new beginning and a new Iraq," he said. Like nearly all Iraqis, Laith Agar had seen unforgettable suffering and death under Saddam —which he said gives him a greater appreciation for life and an appreciation for those willing to lay theirs down for others. "Life is the most precious thing for a human being, and these people have made the ultimate sacrifice," said Agar, a resident of Baghdad. "They came to Iraq and died for Iraq and for all humanity. We will never forget the contributions these heroes have made." Basin Al Fadhly said he wanted to visit Arlington National Cemetery to pay tribute to America's fallen warriors "and to express gratitude to the American people and the American Army that carried out the liberation of Iraq from Saddam." For Hassan Al Gearawy, the visit to Arlington was a way to express his appreciation to the families — particularly the mothers — of U.S. service members killed in his country's liberation. "I wanted to salute them and express my thanks and gratitude to the mothers of those martyrs," he said. Earlier this week, the group visited the White House, where President Bush told them he was "honored to shake the hand of a brave Iraqi citizen who had his hand cut off by Saddam Hussein." The president praised Dr. Joseph Agris, a plastic surgeon based in Houston, who conducted the surgery to put new prosthetic hands on the Iraqis, and Don North, a documentary producer who brought the plight of the seven merchants to Agris's attention. "These men had hands restored because of the generosity and love of an American citizen," Bush said. "And I am so proud to welcome them to the Oval Office." ...John Kerry. But it's not what I'd call a "ringing endorsement". ...The emerging Kerry platform suggests that ultimately he would adopt many of the same goals as Mr. Bush. In his latest speech he rightly warned of the terrible consequences of failure in Iraq and, like Mr. Bush, embraced elections and the training of Iraqi security forces as the best way forward. His proposal for a U.N. high commissioner represents a slight upgrade on the deference already given by the White House to U.N. representative Lakhdar Brahimi; his call for a NATO-led military mission already has been aggressively pursued by the Bush administration, with poor results. There are, in fact, few responsible alternatives to the administration's course. Mr. Kerry's argument is that he has a better chance of making it work. It's not a bold offer to voters -- but it's probably the right one. The Washington Post sees this election as a twenty-inning baseball game. For the first few extra innings, it's exciting. Every pitch is watched, every swing is analyzed. Eventually, though, the tie is not resolved, it becomes boring and you lose interest. You just want the damn thing to be over. While we're remembering those who made the ultimate sacrifice this weekend, I thought it would be appropriate to salute the man who did more for the USO and our troops than just about anybody. He entertained America's Defenders during WWII, the Korean War, Viet Nam, and the Gulf War. Happy Birthday, Mr. Hope, and thanks for the memories! We miss you!!! LtCol Strobl, who's account of escorting the body of Marine Chance Phelps home to Wyoming was featured here - Taking Chance, will be on CNN on "Anderson Cooper 360", Monday, May 31st at 7PM EDT.